The Vancouver Condo Buzz » From Preview Vancouver Riverfront Condos Right Now! From <$400k! South Vancouver RHYTHM at River District Condos by Polygon > Preview Vancouver Riverfront Condos Right Now! 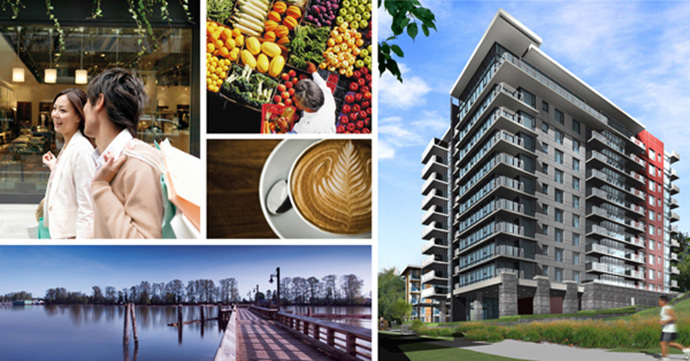 The GRAND OPENING at the newest phase at South Vancouver’s River District by Polygon is now here! Previews started on October 18th with presales now open as of October 25th! The Rhythm at River District Vancouver South condos is a new mid-rise boutique residential building featuring waterview apartments in a masterplanned urban community known for its great location, waterfront neighbourhood and natural beauty. Brought to you by our favourite developer, Polygon Homes, the new River District Rhythm Vancouver South condos are centrally located close to Richmond, Vancouver International Airport (YVR) as well as Metrotown, Vancouver and beyond. Downtown Vancouver is only 20 minutes away by drive. The impressive phased development here at River District provides lots of different housing types that are catered to all sorts of lifestyles, home buyer stages and price points. Here at the new River District Rhythm Vancouver South condos, homebuyers can find affordable apartment residences with premium finishes, outdoor living spaces and impressive views (many facing south!). Riverside living just steps to the Fraser River provides home owners access to great biking and walking waterfront trails, riverfront parks and urban spaces as well as many new and upcoming amenities for the master planned River District Vancouver South neighbourhood. These include food stores, grocers, services like banks, community centres and a new school. On site will be The Rhythm Club that provides a resident only and very exclusive amenity space that features a full fitness centre, a resident lounge with wet bar and a centrally located courtyard with children’s play area, comfortable seating and water features. Marvel at the natural beauty that surrounds you and register your interest with us or online at www.polyhomes.com today for more information about the upcoming presales and grand opening events at the Vancouver Rhythm at River District project. The presentation centre is located at 3292 Riverwalk Avenue Vancouver. The mid-rise residential building at Rhythm River District features West Coast modern architecture which also incorporates some historic-industrial aesthetics for a very interesting and timeless feel. The balance of both modern finishes as well as the industrial highlights (like metal coloured panels, steel accents, aluminum railings and stone cladding) make the Polygon Rhythm Vancouver condo mid-rise truly unique in architecture. Inside, home buyers will find both 1 and 2 bedroom apartment residences with luxurious features that include brand name appliances in marble kitchens along with impressive views of the Fraser River and other green urban spaces that surround you. The homes themselves will have rich wood style laminate floors that are beautiful and durable. The kitchens at the presale Vancouver Rhythm Condos at River District will feature premium stainless steel Energy Star rated appliances that include a Fisher & Paykel bottom mount French door fridge with water dispenser and ice machine, a Bosch electric self cleaning wall oven with ClearTouch glass control and gas cooktop, a Bosch microwave and hood fan (combo unit) as well as a Bosch dishwasher with sleek recessed handle with UltraQuiet sound insulation and convenient Express Wash option. 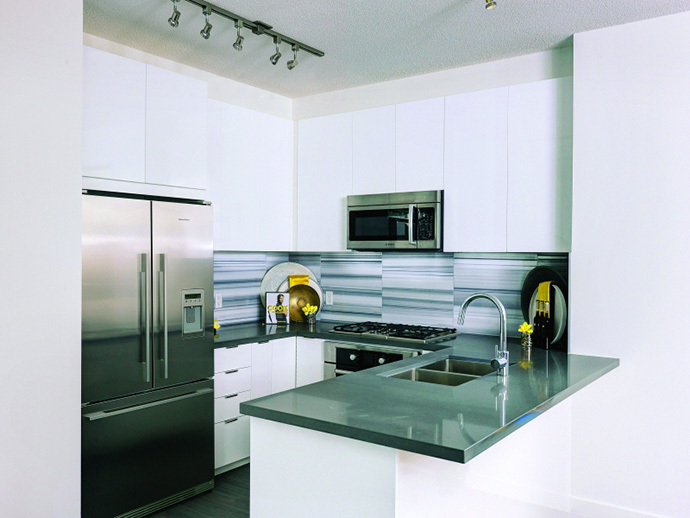 The kitchens at the new River District Rhythm Vancouver South condos will also feature marble tiled backsplashes and premium engineered stone counters (mostly quartz). The premium bathrooms at the Rhythm by Polygon apartments will include sleek marble counters, floating vanity mirror, contemporary soaker tub with ceramic tiled tub and shower surround in select floor plans that are accented with glass tilework and a frameless glass door. At over one hundred and thirty acres in size, the River District in South Vancouver real estate community features an impressive number of new shops, services, big box retailers, new schools, daycares, parks, trails and community centres to name a few highlights. In addition, easy accessibility to everything in the Lower Mainland makes the South Vancouver River District condos a must-see for any urbanite seeking convenience. 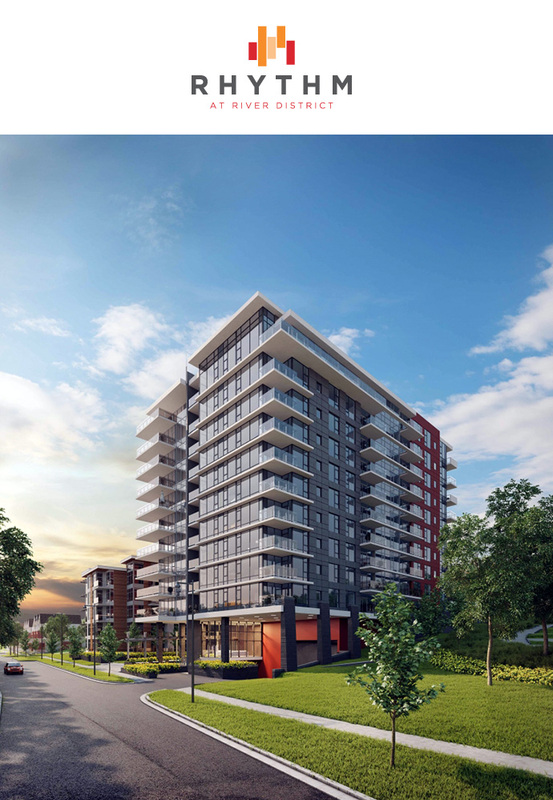 From Richmond and YVR to Burnaby and Surrey, the River District condos including Rhythm Vancouver South apartments are very centrally located close to everything. Add to it a 20 minute short drive to downtown Vancouver, and everything you need is within easy reach. Riverfront Park, Everett Crowley Park and many golf courses are also nearby. Shopping at Marine Way Market that includes London Drugs, a Cactus Club Café and Canadian Tire are also nearby. Situated at the centre of Greater Vancouver, Rhythm at River District is just a few minutes away from Richmond and Metrotown, and a mere 20-minute drive from downtown Vancouver. This inspiring collection of South Vancouver riverfront condominiums also marks the impressive progression of River District – a one-of-a-kind master-planned community by Polygon that unites urban living with natural beauty. 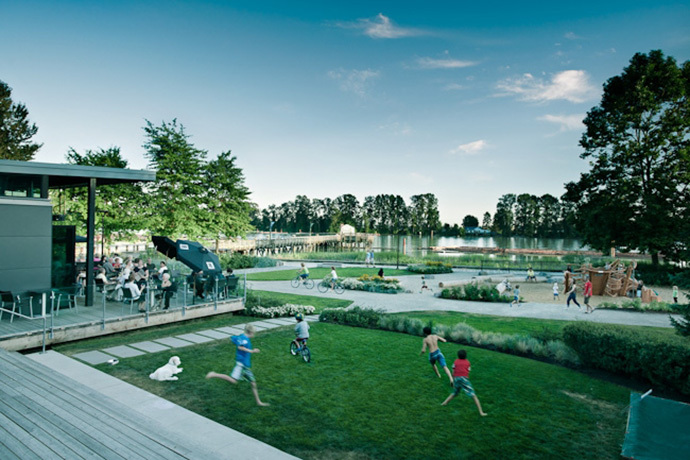 Enjoy quintessential riverside living at its best – just steps from the Fraser River, pier, cycling trails, waterfront park and the neighbourhood’s upcoming amenities such as new schools, restaurants, grocers, services and more. Inside, the one and two-bedroom residences at the South Vancouver Rhythm Condos at River District showcase luxurious features such as marble kitchens and Bosch appliances in addition to sweeping views of the Fraser River or surrounding green spaces. A seamless fusion of convenience and comfort, Polygon’s Rhythm at River District places you in a riverside oasis within the urban landscape. Bosch appliances, radiant heating and spa-inspired ensuites. Official previews started on Saturday, October 18th at 12 noon and presales start on Saturday, October 25th. Polygon’s Rhythm Vancouver Condos bring the best of urban living to a picturesque waterfront location overlooking the Fraser River and surrounding green spaces. Inside, the one and two-bedroom Rhythm Vancouver condos showcase luxurious features such as premium Bosch appliances, radiant heating and spa-inspired ensuites. Being a member of the master-planned community of River District also provides unparalleled privileges as the list of future amenities such as new parks, shopping and services grows impressively. Located just off of Marine Drive at Kerr Street in the master planned South Vancouver River District Rhythm condos is a spectacular collection of waterfront apartment homes that combine natural beauty with contemporary urban living. This fantastic riverside location puts home owners just steps from many biking and walking trails along the beautiful Fraser River, a seasonal farmer’s market and the much loved Romer’s Burger Bar. The new River District Rhythm Vancouver waterfront apartments will feature luxurious interiors with marble counters, upscale appliances and sweeping views of the river.